The latest update of Studio now allows the Dragon to work as a programming tool (not debug)through the JTAG interface on the Key's JTAG port . The (hack)cable in the picture is for ISP programming of the Key. Just broke down and got my client to get me a MKII. Finding that porting Mega88 code to the AT90USB127 is a chore as I now have way too many resources to deal with. The real question is finding a decent way to deal with those odd size headers. I found a HSC (A local surplus/overstock store) some headers, But I have nothing to mate with them. Anyone know the mouser or digikey part number for some sort of transition cable that has decent .1 pitch on one end and these weird spacing on the other? Also how to disable the extras, like the button thingy and the flash memory. I really do not need a lot of IO, I do however need USB. Couldn't you stick with Mega88 and just add an FDTI? 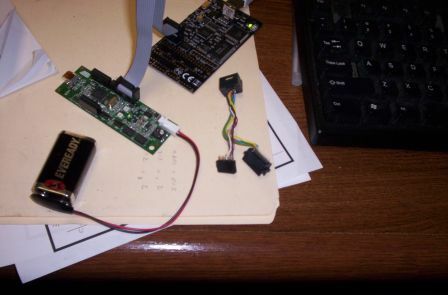 The (hack)cable in the picture is for ISP programming of the Key. for the AT90USB. Do you part number for those female headers? Thanks! The female connectors are from Digi-Key .AMPMODU system 50 is the series. They are a little 'pricey' .I used the 24 pin which allowed me to get 2 ports .The 2 middle set of pins are removed .They can be also cut in half . There is a header that mates with it . The p/ns are A28758-ND and A24832-ND . I just noticed that there are similar parts that are new in the latest catalog that are a little cheaper. The information is much appreciated. It is a driver issue. According to FTDI they do not expose any HID endpoints other than a com port. I have a nice setup working with FTDI but there is no way to make it work decently with existing operating systems. Possibly I could hack a win9x driver, but the client does not want old stuff. With apple I can provide an interface layer, but most users will probably be running XP. I just do not have the three to 18 months it would take to write the drivers. All because I can not change device descriptors in the FTDI chip.